Beach House on Seabrae at Pottsville Beach is a lovely relaxed 'Beach style' property (duplex) just a stones throw away from Pottsville's pristine unspoilt beach (patrolled during Xmas, Easter and September NSW school holidays period) and the well preserved Estuary perfect for swimming and fishing. Just a 1 minute walk from your front door to the top of the street and you have access to Pottsville Beach with Cudgera Creek (the Estuary) just another few minutes walk around the corner via the beach. Pets may be considered and must be kept downstairs, please contact owner for details. A non refundable pet payment of $60.00 is required. 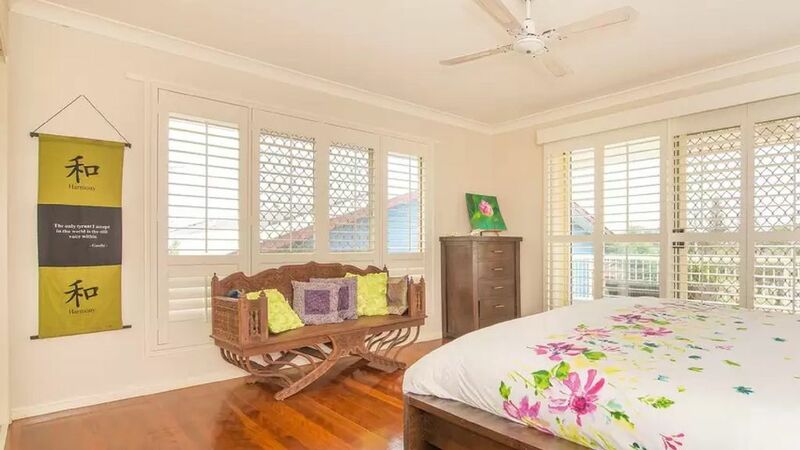 The MAIN bedroom boasts a solid timber Asian KING Size bed (linen is provided), air conditioning, polished timber floors, plantation style shutters opening onto a relaxing private balcony to capture the sea breeze and the sounds of the ocean. The THIRD bedroom includes a SINGLE bed with a pullout TRUNDLE. All bedrooms have ceiling fans and timber flooring which creates a cooling and relaxing atmosphere. A PORTABLE COT is also available for use. The main bathroom is upstairs was renovated June 2015 and has a good size bath and modern shower fittings. There is also a second renovated toilet and shower downstairs. Fully tiled open plan living is downstairs and opens out to the undercover patio areas both front and back. There are 2 outdoor entertaining areas. The back has a BBQ, while the front has a timber deck where you can sit back and relax. Both outdoor areas have an outdoor table setting and there are 2x outdoor daybeds to choose from where you can lay back relax, listen to the ocean and enjoy the sea breeze. The funky 80's kitchen is equipped with everything to make it feel like home including an Italian Mukka (cappuccino/latte making jug) and nespresso coffee machine. But keep in mind there are some lovely restaurants to choose from that are just a 5-10 minute walk from your 'Beach House'. A large separate laundry with a good size washing machine. For the YOUNG GUESTS, we provide a toy cupboard, library of books, dvds & loads of boards games along with children's bowls, plates & cups and a highchair. We guarantee if the kids are happy then you are. There is a good size library of BOOKS for ALL to enjoy, and also a large selection of BOARD GAMES as well as a variety of DVD's and CD's to sit back and enjoy. BIKES for adults and children and helmets - and there are some fantastic bike tracks to explore Pottsville on. One is at the nearby Wetlands (just located 1 minute bike ride from the house -behind the bowls club) and another one that goes all the way to Kingscliff if you're feeling energetic! Large collection of BOARD GAMES. There's also enough toys to keep the children entertained for the whole holiday. ALL OF THIS GOES TOWARDS PROVIDING A HOLIDAY THAT WILL CREATE LIFE LONG MEMORIES OF "OLD FASHION GOOD TIME FAMILY FUN TOGETHER". Featured artwork by local artist is displayed through out the Beach House which adds character to this home. A couple of minutes stroll from the Beach House brings you to the ESTUARY with tidal flow, making it ideal for families swim, play, snorkel and paddle board. Otherwise, across the road is Pottsville BEACH for those who want to surf or swim. During Christmas and Easter holidays it is a patrolled beach. FISHING enthusiasts can find a paradise on Pottsville Beach, or for those who prefer fishing in a creek, Pottsville Estuary is a close walking distance from the house. Fishing licenses can be purchased at the local fish & tackle shop in Pottsville. There are TWICE MONTHLY VILLAGE MARKETS with great bargains to be found (1st and 3rd Sunday) and locals to meet. Gold Coast BUS LINK runs a regular service from the village (5 minute walk) to the Gold Coast and also long distance coach services run through Pottsville. 1 night stays maybe available for $250.00 subject to confirmation by property owner. * Check-in time is not before 3.00pm on the arrival date and check out time is not later than 10.00am on departure date, unless prior arrangements have been made. * Late checkout can be arranged up until 4.00pm for an extra $60 if there are no bookings on the checkout day. * A bond payment $300 is required at the same time as the outstanding balance of your booking. It will be credited to your designated payment method once our property has been inspected and deemed left in a similar state to your arrival. We agree to ensure this occurs within 7 working days of your departure. * Any damage, loss or expense incurred by Owner as a result of your breach of these Terms & Conditions will be charged against the bond. Examples of this include but are not limited to any breakage, damage or excess cleaning requirements, extra guests beyond those declared. During the low season, deposits will only be refunded if the cancellation is advised 14 days in advance. Deposits for reservations made wholly or partially in high and mid seasons will only be refunded if you notify the owner of your cancellation at least 60 days prior to your scheduled arrival. If you provide less than the required period of notice of cancellation, your deposit will only be refunded if the property is re-booked for the same period. Sporting equipment etc can be stored in the garage. Surfboards, Bodyboards and beach equipment available for your use. Thanks Brad for taking the time to review your stay, we are so happy to read that you and your family enjoyed your getaway to Pottsville Beach. We like to make the home feel like a 'good ol' fashion family beach stay with all our board games'. Really well presented home and welcoming beach vibe, we all loved it including our pup! House really comfortable, clean and with everything you could need (+more). Loads of books and games, spare towels in case you’ve forgotten them (there is a charge for the linen pack but at least it’s an option). Really clean and so close to the beach. House is on a quiet corner pocket, close to town, with use of bikes and scooters too. Kids would be amused for days with all the board games and craft in the cupboard!! Thanks Vicky for taking the time to review your stay and I'm so happy to read that you all enjoyed the home. My top priority is to ensure that guests are made to feel at home and I'm glad that you and your family (and dog) did! Loved everything about Seabrae. We were made extremely welcome from the moment we booked. There was also everything we needed for our dog! This place is great for a family or group. There are lots of spaces to hang out together or separately, which takes the pressure off if someone needs a little time out. There are bikes (and helmuts and pumps), pool toys and sunhats, board games (more than a shop's worth), books, magazines, a well-equipped kitchen, a Nespresso machine....it's all here! Pottsville is a sweet little place and the creek is just perfect for swimming or floating down to the river mouth on the current. One small thing to note: there's no wifi and data is weak. Tip: go out the back by the BBQ and hold your phone up. You should get a few bars. The other tip: there's a track to the beach at the end of Seabrae. We missed it at first, but there's a walkway between two houses. Go straight and you're at the beach, turn right and you'll hit the creek. Pottsville has everything you need and the surrounding countryside is gorgeous. Thank you very much for your lovely review Andrew. It's always such a pleasure to read when guests enjoy their stay and the home. It's the 'icing on the cake' for us when we get feedback like yours as we love preparing the home for our guests and hope they love it as much as we do. We had a wonderful weeks break at this property which is the perfect mix of location and home-away-from-home. From the moment you arrive, Sally makes you feel welcome and at home with a few personal touches that meant a lot to us (and our 6yr old son). She has worked hard to create a lovely home that has absolutely everything for every occasion! The amount of outdoor equipment/games/toys/books was a wonderful - our son loved trying something new every day. This is a dog friendly property and again a few personal touches from Sally certainly made it clear that dogs are very welcome in this home. The property is a great size in and out, bedrooms were fantastic and the shower was awesome (especially after a windy day on the beach). Pottsville is a very beautiful and chilled out place to spend some time, walking on the beach, fishing/paddling in the estuary and looking for crabs or taking a wander into the centre (about 10 min walk from the property). We have many happy memories of this holiday and that is largely thanks to the comfort of this property and how easy it was to enjoy ourselves there.